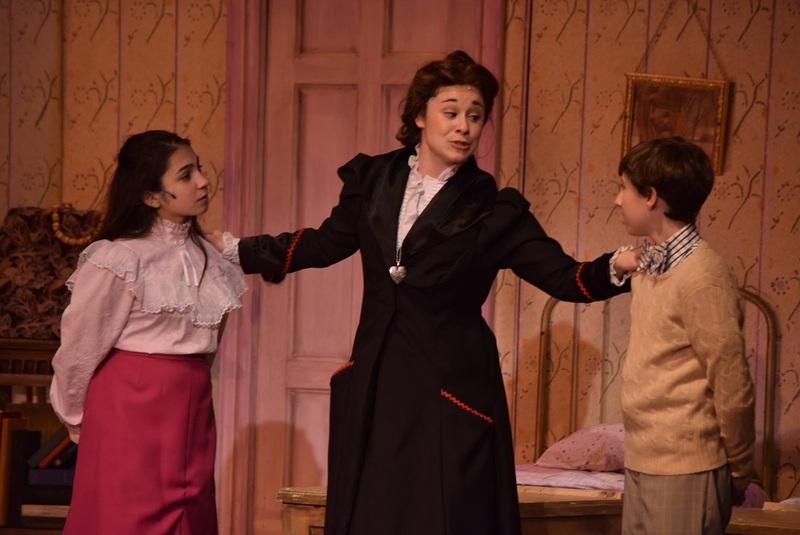 nj arts maven: GUEST REVIEW: HOLIDAY MUSICAL “MARY POPPINS” A SPECIAL FAMILY TREAT! GUEST REVIEW: HOLIDAY MUSICAL “MARY POPPINS” A SPECIAL FAMILY TREAT! Centenary Stage Company is in "supercalifragilisticexpialidocious” mode with it’s excellent high-flying production of the ​f​amily ​h​oliday ​m​usical Mary Poppins with a cast of 70! This version of the hit Broadway show pulls out all the stops: charming, now classic, story, with all the songs, impressive choreography, costumes and sets plus a large orchestra. 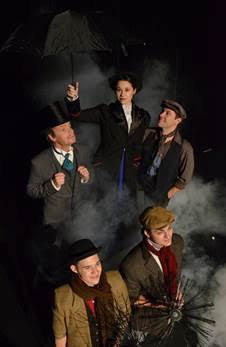 The fine cast is a combination of CSC staff, Centenary University Theatre Department faculty and students, Young Performers Workshop students, local regional talent, and professional guest artists. This is the version from Disney and Cameron Mackintosh that was on Broadway for over 2,500 performances and received nominations for nine Olivier (London) and seven Tony Awards, including Best Musical. Note that the stage musical is not a direct adaptation of the Disney film, but features elements of the film and the original books, plus original updated elements. ​Director and choreographer Michael Blevins has selected an outstanding cast. ​ First and foremost, there can be no Mary Poppins without a Mary who is charming, lovely, plus dances and sings beautifully..... Blevins selected a Mary with all those qualities, and more....McKenzie Custin (she was also a standout ​as​​ Dorothy in the CSC's 2012 production of The Wizard of Oz. ​ In that review we wrote: ​"The very impressive young lady who is Dorothy Gale​--​-McKenzie Custin​,​ not only has a beautiful voice, but is a fine, charming actress who does the magic red shoes proud." Perfect in both classic roles. Former YPW alumni, Justin Boccitto excels as Chimney Sweep/Sidewalk Artist ​‘Bert’. He can do it all; actor, singer and dancer. Centenary Stage Company favorite Osborn Focht ​(last season’s Scrooge in a ‘Christmas Carol’) is spot-on as the reserved to a fault father George Banks. His touching 'A Man Has Dreams'/ 'The Life I Lead' is a musical highlight. Mrs. Banks is played to perfection by, another CSC favorite, Maria Broduer. She is a properly warm and caring mother...very elegant in her Victorian era clothes and hair-do. The key parts of the Bank's children are played nicely by Olivia Berlingio as Jane and Sebastian Gutkin as Michael. They both are clearly at easewith the professional cast members around them. CSC veteran, Jeremy Hilgert, adds to the fun in the dual roles of Admiral Boom and the Bank Chairman. We were also impressed with Chris Kolwicz as Northbrook, the young entreprerneur seeking a bank loan. Making a quick effective cameo is, the CSC's artistic director, CarlWallnau as the shady financier Von Hussler (perfect name!). A standout turn( i,e. 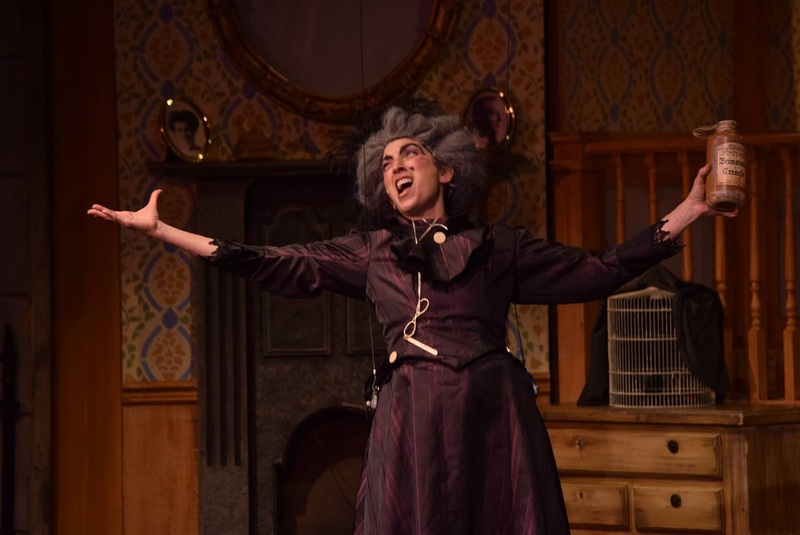 showstopper) is performed by Lea-Antolini as Miss Andrews, the nastiest nanny this side of Hades. Only one word describes her performance: wonderful. She was a NJ Footlights Award winner with her high-flying Peter Pan two seasons ago...here she returns to the air! ​​Special mentions are in order to Jane Bynes for her lovely 'Feed The Birds' and Tyler Donovan as the dancing statue Neleus. ​​Rounding out the principle cast are Cara Kramer, Jeff Foote, Megan McGill, James Russo, Donald Danford, Deirdre Bryant-Worth, Cindy Livingstone and Debbie Lockwood. The Ensemble—park strollers, kite flyers, customers, sweeps, messengers, toys, bankers, clerks, secretaries, statues and dancers—are Tatiana Garcia, Maxine Spann , Jenna Black , Cydney Black, Megan Schmiedhauser , Victoria Pulido, Iyonnah Cousins, Ameer Copper, Claudia Raglievich, Dominick Garatino, Joshua Boyer, Izac Cruz, Sasha Onishchuk, Nick Bettens, Angelina Taystra, Jana Byrnes, Tom Farber, Joe Anselmo, Brianna Morris, AJ Lewis Lauren Taglienti, MacKenzie Cutcliffe, Tyler Donovan, Nicole Boscarino, Maria Alessi, Ethan Rice, Tess Clark, Guila Bailey, Annabelle Plociniak, Matthew Sigler, Jackson Yawger, Ivana Velez, Rachel Lee, Olivia Mancuso, David Yawger, Sydney Lewis, Lexie Miller, Olivia Ribnicky, Cody Jackson, Andrew Nussbaum, Alani Rose, Brianna Ascione, Gracelyn Donovan, Kiana Rodiguez, Brandon Vita, Andrew Wire, Jovani Catala, Teax Armijo, Elaine Belenguer, Zack Clark, Jacob Jackson,Quinn O’Hara, Raphael Pelczmann, and Kira Herkenham. A word about the dancing: Terrific ... Blevins, as the choreographer, has this large cast dancing at almost every turn. It is a spirited, enthusiastic collection of dance numbers featuring several dance pros working with a highly energetic group of dancers from Centenary's excellent Young Performers troupe. Music is ably provided by a 10-member orchestra led by music director Jared Lee. The members are Tara Crincoli, Tiffany Chung, Jeff Little, Crispian Fordham, Jon Bencivenga, Tim Wendt, Linsay Setzer, Patricia Schmitt, Martika Ross, and Nicholas Cela. Major production credits: producers, Carl Wallnau, CSC artistic director and Catherine Rust, general manager; director/choreographer Michael Blevins; assistant director- Victoria Pulido; assistant choreographer Claudia Raglievich; set and costume design Ashleigh Poteat; light design Ed Matthews; props master Dani Pietrowski; dance captain Zack Clark; and stage manager Sonya Thiel.​ One of the highlights of this production is the flying of Mary Poppins. Credit goes to the highly respected theatrical flying service Flying by Foy. The remaining performances of Mary Poppins are: Fridays December 2 and December 9 at 8 pm; Saturdays, December 3 and December 10 at 8 pm and Thursday, December 8 at 7:30. Matinee Performances are Sundays December 4 and December 11, Saturday December 10 at 2 pm. Ticket prices for Mary Poppins are $27.50 for adults and $22.50 for children under twelve on Matinees and Friday evenings. Saturday evening ticket prices are $30.00 for adults and $25.00 for children under twelve. Thursday evening ticket prices are $27.50 for ALL SEATS. Thursday evening is also our Family Night with a two for one rush ticket special when tickets are purchased in person at the CSC box office as early as two hours prior to performance time. Rush ticket offer is not valid for advance ticket sales and cannot be combined with any other discount or special offer. For more information or to purchase tickets visit centenarystageco.org or call the box office at (908) 979 – 0900. Tickets may also be purchased in person at the CSC box office located in the Lackland Performing Arts Center on the campus of Centenary University; 715 Grand Ave. Hackettstown, NJ. The box office is open Monday through Friday from 1 – 5pm and two hours prior to every performance.